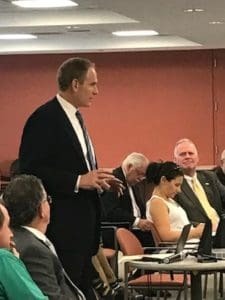 Syosset, NY – October 2, 2018 – Calling Long Island “the epicenter for major transportation innovation in the state,” MTA Chief Development Officer Janno Lieber provided an overview of the organization’s major rail infrastructure initiatives to a recent meeting of the Long Island Regional Planning Council, the only planning body representing Nassau and Suffolk counties. Lieber noted the LIRPC’s long-standing support for transportation improvements: “The MTA relies on the leadership of elected officials who ‘get’ the importance of infrastructure to our future, to our families and to our economy.” In fact, the Council serves as a catalyst for action by proposing and supporting implementable short and long-term solutions for issues of regional concern. Of the 100 rail projects underway on Long Island, Lieber outlined the transformative benefits of the three most significant enhancements – the Double Track from Ronkonkoma to Farmingdale, the Main Line Expansion from Hicksville to Floral Park, and the East Side Access from Long Island to Grand Central Terminal. Allow for a fully functional “reverse commute” from New York City to Long Island, so that regional businesses and institutions can compete for knowledge workers. Lieber said the 18 miles of a second track, running from Ronkonkoma to Farmingdale, opened last month. The project will increase both in-bound and reverse commuting capabilities and minimize service interruptions. He also noted the important economic benefits along the corridor, such as accelerating Transit-Oriented developments in Ronkonkoma, Wyandanch and Farmingdale, and increasing service capability to nearby Islip MacArthur Airport. The addition of a third track to the 10-mile Main Line corridor, from Hicksville to Floral Park, is “essential to the whole railroad,”Lieber said, pointing out that 40% of LIRR riders pass through that line on a daily basis. Along with increasing service in both directions and reducing delays, he noted the project includes significant safety benefits by eliminating 7 grade crossings and raising bridge clearances at 7 other locations. “The Third Track Expansion is being done with a real community conversation,” Lieber continued, engaging all involved stakeholders and tying a portion of contractor compensation to community ratings. “This is a chance to pioneer a model of good project management,” he noted. Lieber noted that full details on all MTA/LIRR infrastructure improvements are available at www.AModernLI.com.